The spirit of indie comics is alive and well at Dynamite Entertainment. 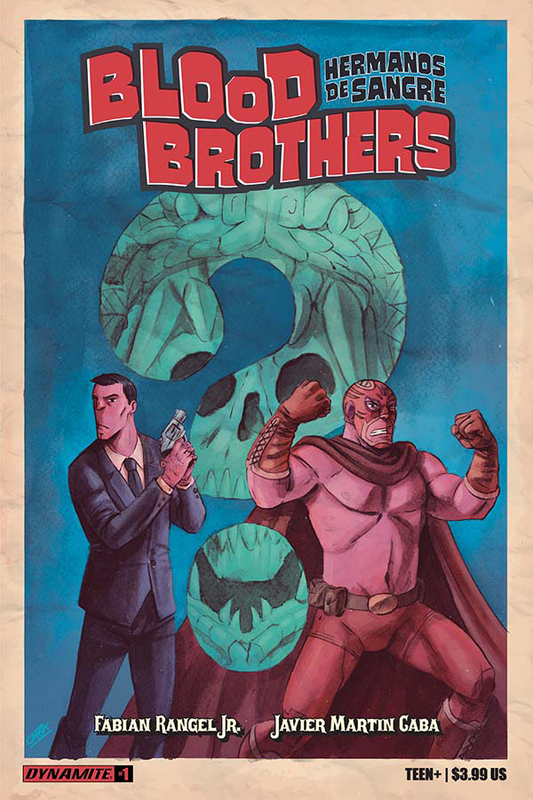 'Blood Brothers: Hermanos De Sangre' #1 by Fabain Rangel, Jr., and Javier Caba a free-wheeling fantasy series with a lot of charm and mystery. Diego and Gabriel Soliz are brothers with a particular set of skills. They're not your typical detectives but then again, there's nothing typical about their world. Diego likes a drink or two with a side order of mayhem. The clean-cut and slim Soliz brother is a magnet for trouble because his aggressive style has given him a less than great reputation. Gabe, by comparison, is the level-headed gentle giant who dresses as a luchador and has the skills to prove it. It comes in handy when Diego's mouth gets him in trouble. Oh, Diego acquired the ability to speak to spirits of dead people and Gabe has some sort of "Spidey sense" that makes him glow. That's not even the strangest part. Rangel's world-building in this strange new world is dense but fast-paced. There are several mentions of "The Break" that we can assume alludes to how the city became populated by creatures from mythology and fantasy. It's perfectly normal to have a drink in a bar surrounded by patrons that happen to be cyclops, ghouls, vampires, werewolves, etc. It's a new reality and the Soliz brothers are more than up for it. An Aztec skull is stolen from a museum and the investigation reveals it's tied to a member of the Soliz family. 'Blood Brothers' becomes a mysterious police procedural in a quirky new setting full of colorful characters with a light-hearted pulp crime noir approach. I couldn't help think of another indie comic from 1990, Men in Black. The comic that was adapted into a blockbuster movie franchise starring Will Smith had a similar vibe. The agents like the detectives in this story seem perfectly at ease among the aliens around them working leads, interviewing suspects, like any other crime story except in a fantastical setting. The humor was also tongue-in-cheek and breezy. The dialogue reveals a caring supportive relationship between the brothers. The chemistry works and makes them more engaging as a result. The action and intrigue escalate as the story continues leading to a big confrontation. Rangel doesn't give away too much information. In fact, you may end up with more questions than answers as I did by the cliffhanger ending. It's still a fun ride that feels what an indie comic should - fresh and experimental. Caba lays out a compelling story and really concentrates on unique fun character designs. How often does an artist get to draw a werewolf or a cyclops? Backgrounds are sometimes sparse but the stars are Diego and Gabriel so they are front and center most of the time. The pacing is quick without being rushed as one scene leads to another with deliberate and thoughtful transitions. The "Mos Eisley Cantina" scene is worth devoting some time to scan the page for Caba's creative designs. Overall, Caba delivers energetic fast-paced illustrations that are sometimes raw but bright and colorful. 'Blood Brothers: Hermanos De Sangre' manages to blend in Spanish phrases and words seamlessly making the interaction between brothers natural and realistic. Rangel and Caba are solid pros with an indie spirit that remembers how entertaining comics can be. It's the start of a fun mysterious adventure worth taking.